Big Chief have been updating their Facebook page these last couple of weeks with some great sneak peeks at their upcoming figures. We've already seen their 11th Doctor Dynamix Figure, but now they've released the first behind the scenes picture of their upcoming 1st Doctor figure. Just the unpainted headsculpt for now, by my goodness it looks fantastic! A spot-on likeness for William Hartnell. I'm really looking forward to seeing how the rest of the figure turns out and what bits and pieces he'll be released with! 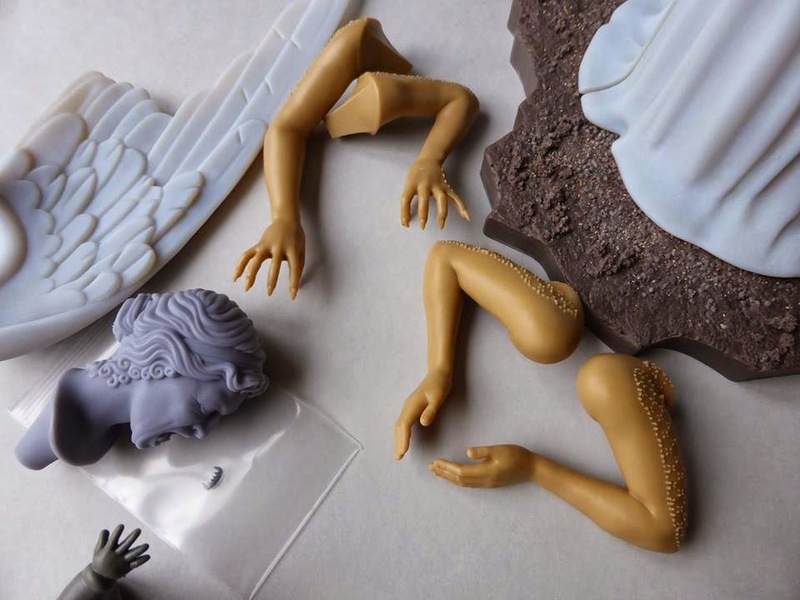 Finally a behind the scenes image of their upcoming Weeping Angel was released on the 6th, and it looks very intriguing! From what can be seen it looks as if the figure will have interchangeable heads and arms to create a variety of weeping and screaming poses. The arm of a Cherub can also be spotted, suggesting one of those (or more?) will come as an accessory. The figure appears to come with some form of base that appears to be soil or earth of somesort. Very interested to see more of this! That Hartnell head looks to be there best sculpt to date.